Question: I have never heard of the prophecies of Our Lady of Good Success. Is this a new apparition? Has it been approved by the Church? Answer: This is not a new apparition. It took place in the early 17th century. The revelations of Our Lady of Good Success and devotion to Her miraculous Statue have been approved by the Catholic Church since the beginning. It was the 9th Bishop of Quito, Salvador de Ribera, who attested in official documents to the miraculous completion of the Statue by St. Francis of Assisi and the three Archangels – St. Michael, St. Gabriel and St. Raphael – and presided over the anointing of the solemn consecration of the Statue in the Church of the Royal Convent of the Immaculate Conception on February 2, 1611. The devotion and apparitions were also authorized and promoted by the next Bishop of Quito, Pedro de Oviedo, who governed the Diocese from 1630 to 1646. Thus this devotion has enjoyed the support and approval of the Church since its very beginning. Answer: Mother Mariana de Jesus Torres (1563-1635) was a Spanish Conceptionist sister who traveled from her country to the New World to help to found the Royal Convent. The life of Mother Mariana was truly extraordinary. The number of visions and mystical favors granted to her as well as the miracles worked through her intercession are numerous. During her live, she was the superior of the Convent three times. During her first term as Abbess, she suffered persecutions from a group of rebellious nuns who wanted to relax the Rule. The rebellion grew, and the “inobservant” sisters put Mother Mariana and the other Spanish Founding Mothers in the Convent prison. 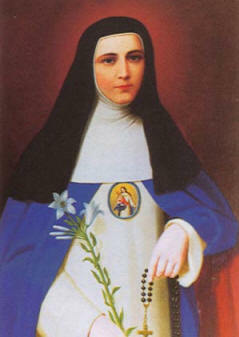 Mother Mariana accepted all this and agreed to Our Lord’s condition to suffer the torments of Hell for five years in order to obtain the conversion of the leader of those rebellious sisters. Question: Why haven’t I heard of these apparitions until recently? The invocation was not long in making its way across the ocean to the New World. The Blessed Virgin deigned to favor the Convent of the Immaculate Conception in Quito in a very special way by means of this particular avocation. In an apparition to Mother Mariana de Jesus Torres, the Blessed Virgin appeared and asked that a statue be made of Her under the title of Good Success. She should be made just as she appeared to Her there, with the Child Jesus in her right arm, and the Abbess’ crozier and the keys of the Convent in her right hand. She should be placed above the Abbess chair in the upper choir because She desired to be Abbess of that Convent until the end of time. 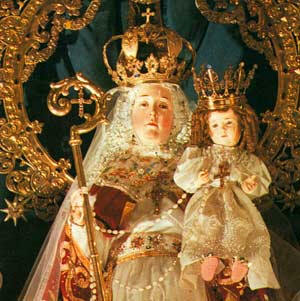 And so the Virgin of Good Success of Quito appears with the crosier in Her right hand, instead of the scepter that She carries in Madrid. Answer: That is not the original Spanish connotation. The invocation of “good success” refers to the happy development of the gestation of Christ from the Conception to Birth. The invocation of “good success” was understood by the faithful in its first meaning as a simple plea for safe childbirth. This easily extended to the invocation of Mary’s meditation and intercession in times of personal need (sickness, travel, marriage).